Service management processes aim to transform the service provider's resources into valuable customer services. These services are to be made available at agreed levels of quality, cost, and risk. 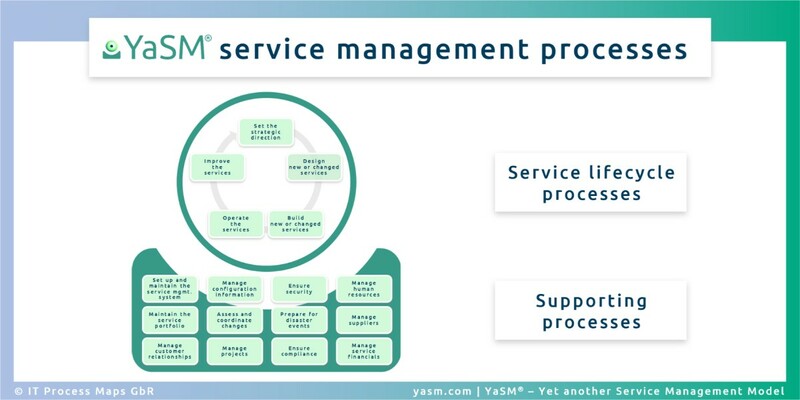 In the YaSM service management processes we distinguish between service lifecycle processes and supporting processes. The supporting processes provide various kinds of support to the service lifecycle processes, such as the management of customer relationships, projects, etc. 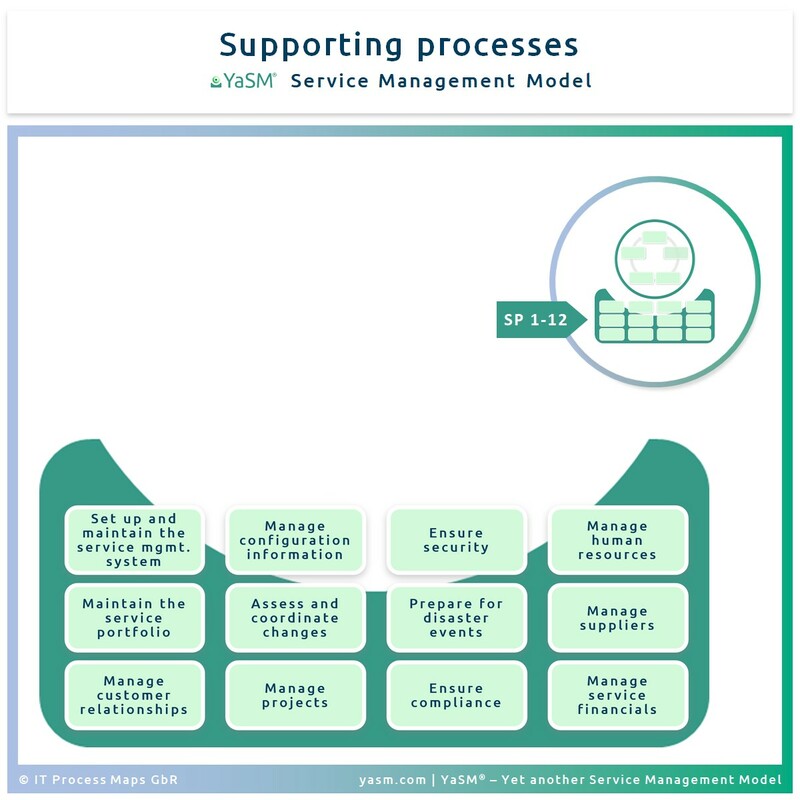 Below is a brief introduction to the YaSM processes, highlighting their purpose within the YaSM service management model and the most important activities. We recommend reading this introduction in combination with the YaSM glossary, where you will find definitions of all service management terms. 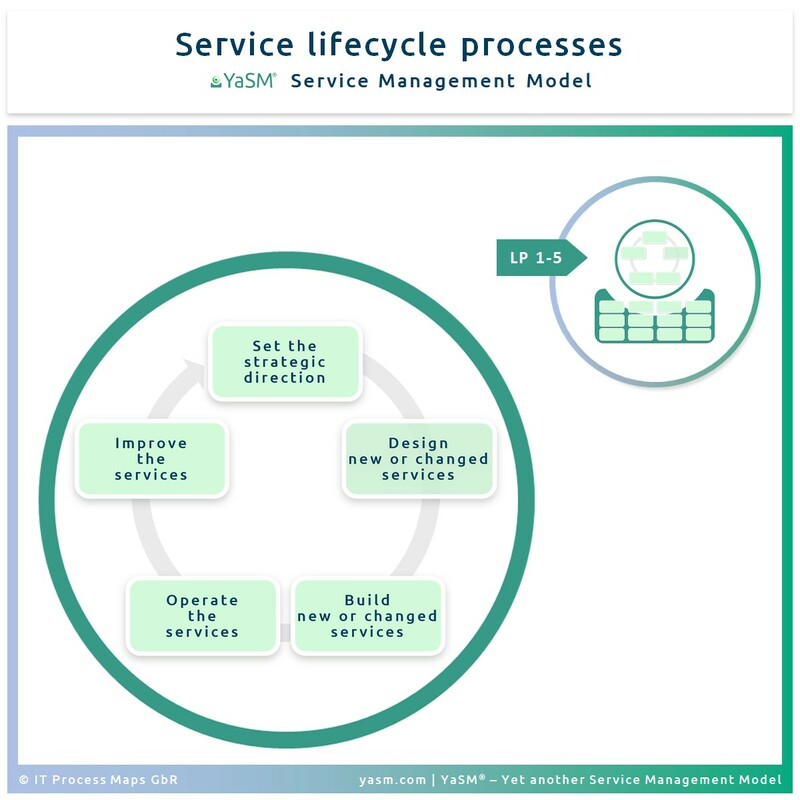 The lifecycle processes ('LP') in YaSM service management are directly concerned with managing the service provider's range of services across their lifecycle. Strategic assessments of the service provider's current situation and future developments provide the basis for deciding which services are to be offered to customers. Once that decision has been made, the service lifecycle processes will design, build, deploy, operate and constantly improve the services. Process objective: To decide on a strategy to serve customers. Starting from an assessment of customer needs and the market place, the strategic process determines which services the organization is to offer and what capabilities are required. Process objective: To define the expected outcomes and required properties of a new or changed service, to determine the infrastructure and other capabilities which are needed to provide the service, and to develop the approach for its implementation. Process objective: To build and deploy new or significantly changed services. This includes the coordination of development, acquisition and testing of all required service components. Process objective: To ensure the services are delivered effectively and efficiently, in line with the contractual commitments. This includes fulfilling service requests, resolving incidents and problems, as well as carrying out routine operational tasks. The service operation process includes two prominent sub-processes, LP4.6: Resolve incidents and service requests and LP4.7: Resolve problems. Process objective: To continually check if the services deliver the required outcomes and to identify potentials for improvement in the way the services are being produced. The supporting processes ('SP') in YaSM service management provide various kinds of support to the service lifecycle processes. Process objective: To establish, operate and continually improve the service management system (SMS). In particular, this process is responsible for managing the service management policies and processes as key components of the SMS. Process objective: To ensure the service portfolio contains consistent and up-to-date information on the services managed by the service provider. This is mainly achieved by controlling changes to the service portfolio and service definitions, as well as performing regular service portfolio reviews. Process objective: To maintain a positive relationship with the customers. In particular, the customer relationship management process identifies potential new customers and ensures that regular feedback is obtained from existing customers through customer meetings and surveys. This process is also responsible for signing customer service agreements with the service provider's customers. Process objective: To maintain information about configuration items required to deliver the services, including their relationships. Process objective: To control the lifecycle of all changes. The primary concern of the change assessment process is to enable beneficial changes to be made, with minimum disruption to services. Process objective: To plan and coordinate the resources to complete a project within time, cost and scope. Process objective: To ensure the security of the service provider's range of services, and to align the security needs of the service provider with those of its customers. This includes ensuring that systems and data are protected from intrusion and only accessed by authorized parties. Process objective: To ensure that the service provider can provide minimum agreed service levels in the case of events considered disasters. This is achieved primarily by implementing mechanisms to prevent disasters from happening, and by establishing continuity plans and arrangements for the recovery of services once a disaster event has occurred. Process objective: To ensure that services, processes and systems comply with relevant legal requirements, standards, enterprise policies etc. Process objective: To provide the skills and levels of staff required by the service provider to achieve its objectives. Process objective: To ensure that all agreements with suppliers support the needs of the business, and that all suppliers meet their contractual commitments. Process objective: To manage the service provider's budgeting, accounting and charging requirements. 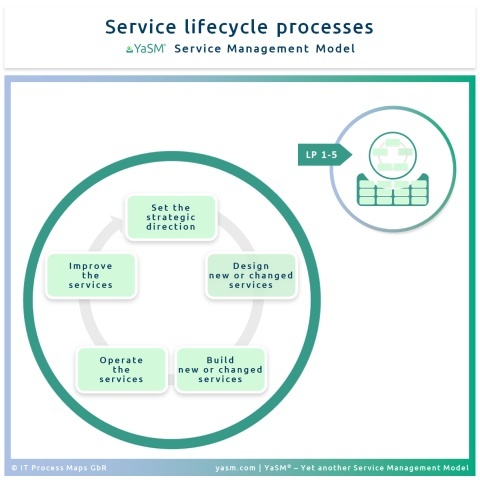 Those familiar with ITIL® will recognize the similarity between the YaSM process structure and the service lifecycle introduced with ITIL V3 - but also the differences (see also: "How YaSM relates to ITIL V3"). Some of the complexity in ITIL V3 results from the fact that ITIL places every process in one of five service lifecycle stages. Configuration management, for instance, is part of the service transition stage. But configuration management activities take place at various points across the service lifecycle, and configuration information is needed as an input for virtually every ITIL process. It is thus more straightforward and intuitive to treat the management of configuration information as a "supporting" process outside the service lifecycle. 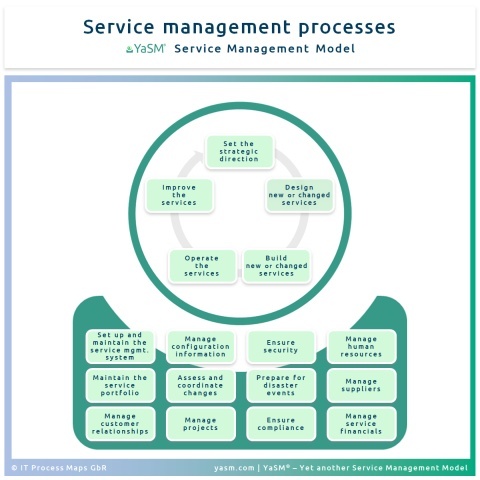 Based on: Reference processes for enterprise service management (ESM / BSM), IT service management (ITSM) and ISO 20000 from the YaSM Process Map. Trademarks: ITIL® is a registered trademark of AXELOS Limited.